TransportiCA: Happy Holiday from CalGreen! 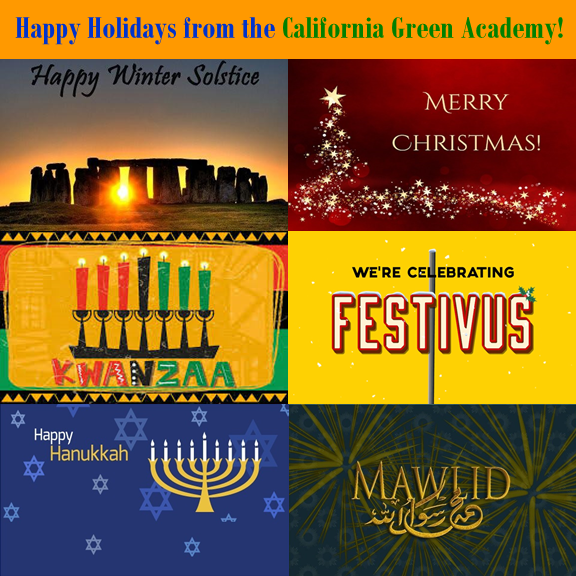 No matter what you do or do not celebrate this season, on behalf of TransportiCA, Nonprofit Studies, the Sustainable Chamber of Sacramento, and all of the programs of the California Green Academy, Happy Holidays, and we wish you all the best this season! If you are looking for a meal, please contact the California Association of Food Banks at: http://www.cafoodbanks.org/find-food-bank, or via phone at 510.272.4435, and/or the California Emergency Foodlink at 800.283.9000 / 916.387.9000 (local), or http://www.foodlink.org/contact/.